We know it, do you? 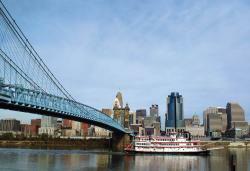 Yes, Northern Kentucky has assets – great meeting spaces, riverfront entertainment, family activities and so much more. Add in the fact that NKY is also affordable and you have the perfect mix for tourism and events! On February 7, The Lane Report boasted that Northern Kentucky accounts for one-fifth of the state’s roughly $14 billion tourism economy. Many of us already know that NKY is awesome, but what does this really mean for those of us who work, live and play here? Increase in job creation – as demand for NKY grows, so will the job market. Simply put, as more people visit the region, more workers will be needed in the service industry to ensure that the visitors have a satisfying experience. New customers and more sales for local businesses – as visitors poor into the area, local shops and restaurants benefit from the added traffic. More fun to be had – NKY is experiencing exponential growth, from housing to storefronts to entertainment districts. This growth leads to more fun things to do and see, making the area even more exciting and valuable. And how about for those folks that haven’t yet discovered NKY? Consider yourself invited and check us out – there is always something for everyone here!